Menu: Crackers and cheese to munch on while cooking, and the pasta is plenty for dinner! The summer sun has finally arrived in Denver!! This year has brought some crazy and unusual weather. It started off with one of the mildest winters. I’m talking January 17th and 70 degree sunshine days. Then late winter and spring kicked in and winter decided to show and kill our spring…boo. I think it’s safe to say that summer is a comin’ at this point! This weekend we enjoyed lots of sun (Amanda has the burn lines to prove it!) and tons of activities. Saturday morning we did a 5K charity run for NAMI. Then we rushed home as our local neighborhood association had an awesome party at our nearby park. So, we took the dogs over and soaked up some rays with friends and food. It was a GREAT day. 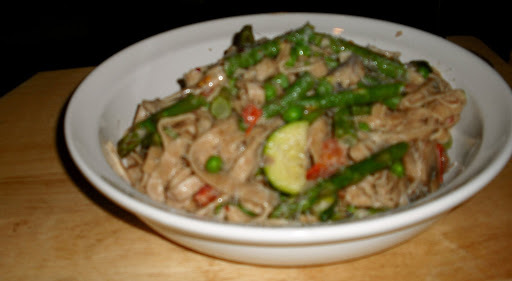 Naturally, I had to find a perfect meal to top of a perfect summer day…pasta primavera! Bring 4 quarts water to a rolling boil in a large pot for the pasta. Bring 3 quarts water to a boil in a large saucepan for the vegetables; adding 1 TB salt to each. Fill a large bowl with ice water and set aside. Add the green beans to boiling water; cook for 1 1/2 minutes. Add the asparagus; cook for 30 seconds. 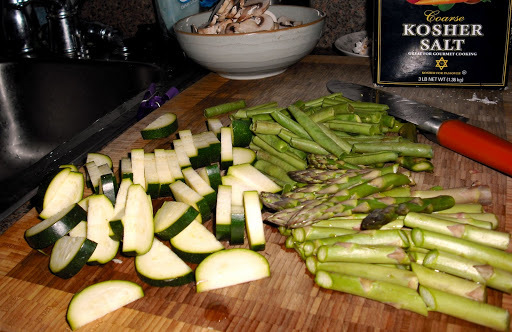 Add the zucchini; cook for 30 seconds. Add the peas; cook for 30 seconds. Drain the veggies and immediately plunge into the ice water to stop the cooking process. Let them chill for about 3 minutes, drain well and set aside. Heat 3 TB butter in large skillet over medium-high heat. Add the mushrooms and saute until browned and they have released their juices, about 8 minutes. Add the tomatoes and crushed red pepper, reduce heat to medium and summer until the tomatoes begin to break down and lose shape, about 7 minutes. Add the cream and simmer until slightly thickened, about 4 minutes. Cover pan to keep warm and set aside. Add pasta to pot and cook until al dente. Heat 2 TB butter in large skillet over medium heat. Add garlic and saute until fragrant. Add the blanched veggies and cook until heated through, about 2 minutes. Bring the mushroom and tomato mixture back to a simmer. Drain pasta and return to pot. Pour mushroom tomato and veggie mixture over pasta. Add lemon juice, basil, S&P and toss well to coat pasta.